On the 31st of January, I went to Eason's on O'Connell Street, Dublin, to meet one of my favourite YouTubers of many years. Zoella, the beauty vlogger with now 10 million subscribers, held her Girl Online On Tour book signing in the shop and I was so lucky to attend it. Originally this book signing was scheduled for the 8th of November, but unfortunately the YouTuber became sick that weekend and changed it to the last day of January. I didn't mind at all. 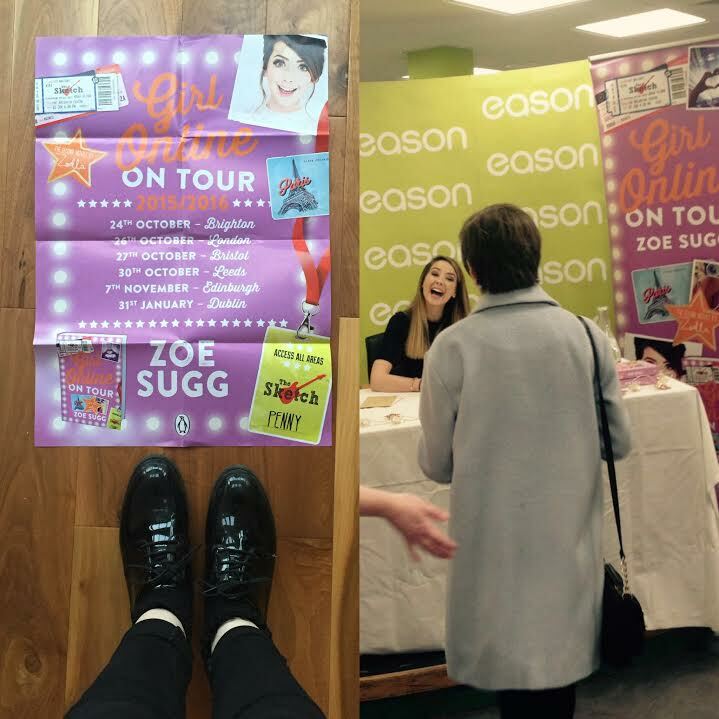 The longer wait meant I became more and more excited every week about meeting Zoe Sugg. be in fifteen minutes. I was expecting a bigger buzz in the queue, but with the dismal weather and an abundance of bored parents being there with their daughters, there wasn't much extreme fan-girling. Our excitement grew as the queue became shorter and shorter ahead of us. Eventually we got inside, gave our names and received our Girl Online On Tour books. It still didn't feel real that I was about to meet Zoe, whose videos I've been watching since 2012. I found her channel and blog through Louise (Sprinkle of Glitter) way before she reached one million subs. It's amazing how much her channel has grown since then! As I've said many times before, meeting anyone that you've only got to know through the internet is a weird but wonderful experience. You realise that they don't just exist on the screen; they're breathing and living. This was different from meet ups with my blogger friends; they know me, but Zoe doesn't know me at all, which is odd since I seem to know so much about her life. Meeting her was the one of the quickest and slowest fifteen seconds ever, much like when I met Miranda Sings / Colleen Ballinger. Zoe's stand was up the escalator in the book shop. Mia and I thought there was going to be another queue when we went up, but nope, there Zoe was in all her beautiful glory just a few metres away. There were only two people ahead of us, then it would be time for our turns. We panicked slightly, trying to take a quick photo of her before we had to put the phones away. Mia snapped one of her, which you can see below. I was fumbling around for my phone but I couldn't find it. One of the staff told me I could place my coat down, so I did so. Suddenly, my phone goes flying across the room, just as it was my turn to meet Zoe. I saw another staff member pick up my phone, and she knew it was mine. All rushed and nervous and excited, I walked up to Zoe with my book open. I had it all planned in my head; I'd say hello, she'd say hi back and start signing my book. I would stay cool and collected. I'd tell her how much I love her videos and blog, maybe congratulate her on 10 mil. I'd say she inspires me when I make videos and write on my blog. Then she would ask what the YouTube and blog are called, and I'd say Queen of Quirk, and she would promise to have a look at them. And I'd ask for a quick hug, and I'd leave. That's not near how it went. Zoe: Hi, how are you? Me: *in a high pitched voice* Good! Zoe: I love your cat ears. Me: *part of me dies* Thank you!!! Me: I love your videos! Me: *takes book, starts to walk away* I love you! Zoe: I love you too! While I do regret a few things from the book signing, like how I didn't try and get a photo of some kind or say what I wanted to say, I am so so so grateful to have met one of my idols. She looked so pretty; her hair and make up was gorgeous. She was smaller than I thought, with a petite, cute head. Zoe was so smiley and lovely, and her adorable British accent was more obvious face to face. After meeting her, overwhelmed with shock and happiness, I collected my phone from the lovely Eason's staff. She also gave me the book tour themed wristband and poster. I rejoined Mia, and we left the shop elated. There was a cool arty wall beside Eason's that I just had to use for my OOTD photos. Mia was kind enough to take them for me, and she was amazing - they turned out so well (thank you Mia)! You can't exactly see the tank top clearly, but its caption says 'More Issues Than Vogue'. I managed to find the same quote on a copy in Penney's that day (I bought it without hesitation). I wore my new Yin and Yang necklace from Claire's; I've wanted a short black choker style necklace for ages, and I'm loving Yin and Yang right now so this necklace was a must-buy. It looks snazzy with my detailed collar. As we're talking about accessories, I must mention that my cat ears are now to be called my 'Zoella cat ears' because of her glorious compliment. It's funny because she probably didn't think twice about it. That morning in Dublin was fantastic. I'll always remember my fifteen seconds with Zoe Sugg. I hope she liked her first visit to Ireland! Are you a Zoella fan? Oh my gosh, how cool! SO glad you were able to do that. I love what you wore as well. You look gorgeous! Thank you Shannon! It was amazing! You look so cute, glad you had fun! You're so lucky to have met her! Sounds like a lot of fun, although I feel bad for you about forgetting what you wanted to say! I think that would happen to me too though. And I have to agree with her, your cat ears are adorable!